Our approach to land management and biodiversity restoration is built around the Freese Scale for Grassland Restoration. 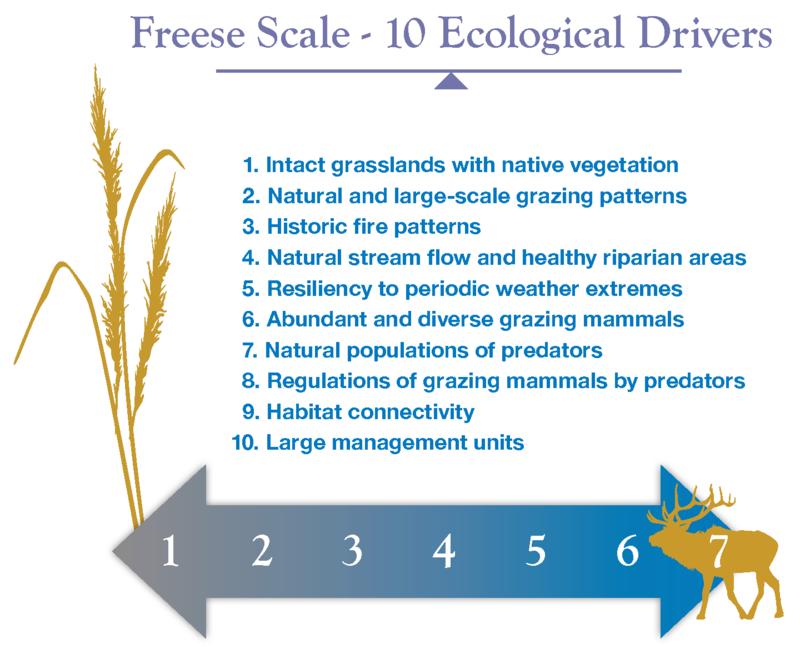 Developed by conservation biologist Dr. Curt Freese with Dr. Kyran Kunkel and Dr. Sam Fuhlendorf, the Freese Scale identifies the ten major ecological drivers for restoring and conserving biodiversity on temperate grasslands. This scale can be used by land managers trying to achieve a balance between agricultural production and biodiversity as well as those, like the Reserve, which are solely focused on maximizing native prairie biodiversity. Download a background summary on the Freese Scale and read the peer-reviewed article in Ecological Restoration on our Reports page. This new common language will not only align us with like-minded organizations and agencies, but it will also enable us to better demonstrate our successes to donors like you.